Nursery students of MRIS-Noida are learning about different people in the community as a part of their ongoing theme ‘Let’s Pretend’. The children were explained about the services and tools of community helpers. 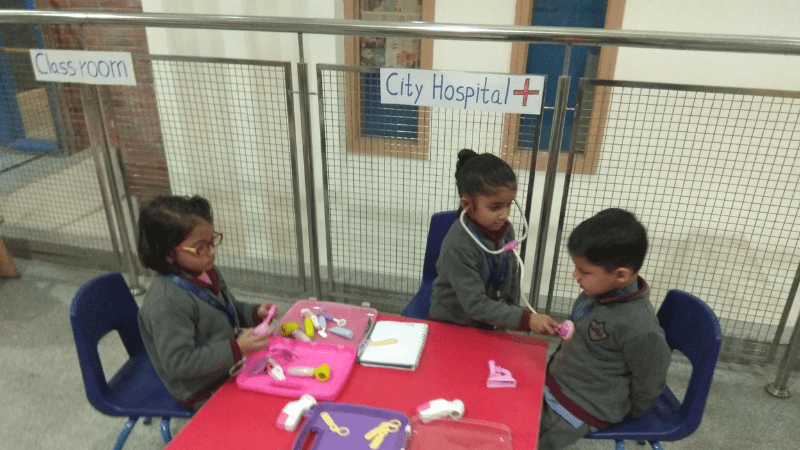 To further enhance their knowledge, a ‘role play’ activity was organized in which the children used tools of different helpers and introduced themselves. They enacted their roles with props along with like- Stethoscope, fire extinguisher, money, weighing machine etc. The value of ‘Respect for all Helpers’ was inculcated in them by making them aware that all jobs are important and worthy of respect. They enjoyed the enactment using different props and displayed immense self-confidence while narrating and enacting.